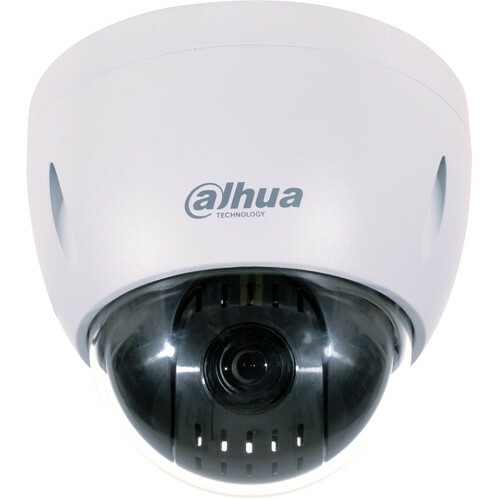 The Pro Series 42212TNI 2MP Outdoor PTZ Network Mini Dome Camera from Dahua Technology has a 1/2.8" STARVIS progressive scan CMOS sensor to capture 1920 x 1080 resolution video at 30 fps. Its 5.3-64mm varifocal lens delivers a 58.2-4.8° horizontal field of view. PTZ functionality offers endless panning, a -2 to 90° tilting range, and 12x optical zoom. Two-way audio is possible thanks to an audio input and output. An onboard memory card slot supports microSD cards up to 128GB. microSD cards are available separately. Integrated PoE technology simplifies connectivity by enabling the transfer of power and data through a single cable. This camera is housed in an IP66- and IK10-rated metal enclosure that is suitable for outdoor use in areas at risk of vandalism. Box Dimensions (LxWxH) 11.55 x 10.9 x 10.9"
Pro Series 42212TNI 2MP Outdoor PTZ Network Mini Dome Camera is rated 5.0 out of 5 by 1. Rated 5 out of 5 by Mark from My best camera out of my 11 cameras The features on this camera (Dahua in general) are plentiful and exhausting (but fun) to investigate.? I use this camera with Blue Iris and it works great using the BI software but plan on configuring the camera's own motion detection software to do the job since there are different aspects from BI.? The nighttime video is really, really good and the daytime is excellent.? I am very happy with this camera and will likely start replacing my cameras with Dahua. Does this camera use IRs? Based on the description it does not look like it. While it does have a IR cut-filter and can be used with an IR illuminator, the camera does not have built in IR. While in scan mode, does this camera stop when motion objects are detected, lock onto moving objects, or track? The camera has the following features: Face Detection, Tripwire, Intrusion, and Abandoned/missing objects. The camera does not have any Gatekeeping feature that would allow the camera to follow a person. I would also not recommend using this camera's PTZ features on a regular basis. Occasional usage is fine. do i need junction box for outdoor mounting and if i do what is the model number? Hi, can someone provide a direct link to the Dahua support site for this camera? I'd like to see what the current firmware is.